We, children of six mothers who are being detained in Chinese labor camp and prison for their belief in Truthfulness, Compassion and Tolerance, undersigned, urgently and respectfully request your assistance in obtaining their release. 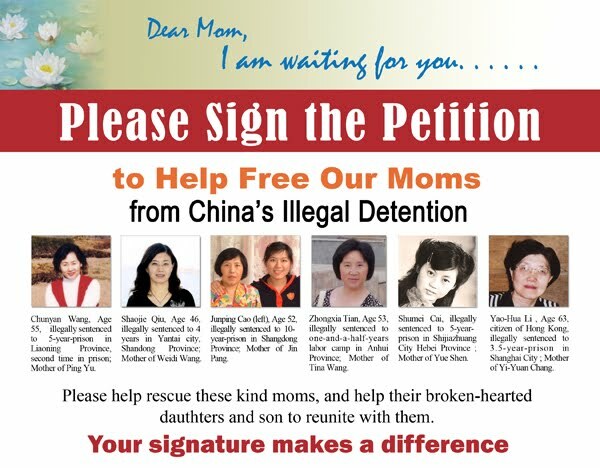 Our moms are being detained solely because they practice Falun Gong which is legal and respected everywhere in the world except China. They are forced to do slave labor and are subject to cruel brainwashing and all kinds of physical and psychological torture. Yao-Hua Li, 64, illegally sentenced to 3.5-year-prison in Shanghai City. Ping Yu, California; Weidi Wang, New York; Jin Pang, Washington D.C.; Tina Wang, Pennsylvania; Mr. Yue Shen, New York; and Mr. Yi-Yuan Chang, California. We miss our moms so much and are worried sick about their safety. Please extend your hands to help rescue our moms. Your voice can make a difference and can contribute to end this 11-year-long persecution by the Chinese communist regime. We also appreciate GMR's great help in coordinating this national petition effort.